I was recently asked to join a project team. I am really growing to like one of my new teammates. She is a recognized expert in our field. She is always focused on supporting others’ needs. And she is easy to talk with; everyone seems to be her friend. So what’s the problem? What I didn’t mention is that sometimes she doesn’t show up for conference calls, and then apologizes profusely. And sometimes the team waits a long time for her deliverables that seem thrown together haphazardly. So I feel stuck — I really like her but started to feel I couldn’t trust her. People talk about trust all the time, but we mostly talk about it out of earshot, behind each other’s backs. Yet how can we cultivate psychological safety and build team performance if we can’t discuss trust directly? In the years I’ve worked with executives and their teams trust is always an issue. In needs assessment interviews people inevitably say, “We need to trust each other more,” but are usually evasive with specifics. So I’ve been searching for ways to make it easier for teams to talk about trust since it is so crucial to team effectiveness. I believe I’ve found the answer to what I’ve been looking for. Once I learned these factors, I understood why I was having trouble trusting my colleague. She is credible. I feel ‘psychologically safe’ speaking with her. Her ‘other-orientation’ is huge! But the one component she has difficulty with is reliability. This helped me understand my lack of trust in a broader context. It wasn’t that I didn’t trust her; her inconsistent dependability was getting in the way. So I gathered my courage and talked with her about my feelings (she is always open to that). I discussed the four components of trust and gave her credit for three of the four core components. I asked if she thought she could improve in the reliability area. She replied, “No, I don’t think I could live up to your standards.” What?! I couldn’t believe what I was hearing and asked her to elaborate. She said whenever I talked about something she did ‘wrong’ she felt that I always framed it about how her behavior impacted me personally. She said this made me come across as self-centered. She said she felt I was more interested in criticizing her than understanding her, which led her to trust me less. What a moment of illumination! I view myself as a trustworthy person, but didn’t realize that I had a shortcoming in ‘other-orientation,’ one of the four core components of trust. Yikes. I asked her why she didn’t tell me before. She replied, “I guess I didn’t feel psychologically safe,” and we both laughed. This led to a great conversation about how we could work better with each other. We gave it another shot, and now collaborate more effectively than ever. 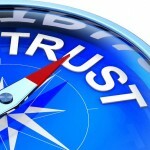 Trust is a big subject that a short blog post can just begin to cover. But Maister’s four core components of trust is a great starting point to have real conversations about what might be undermining a team’s effectiveness. To start, look in the mirror: Rank the four components from your strongest to your weakest. Then, bring the topic to your team, share your self-assessment, and invite others to give you feedback. Before you know it, others will weigh in about themselves and you will be talking (in a psychologically safe way) about how to improve trust in pursuit of the team’s performance. My biggest takeaway from talking with my colleague about the four components is that the best way to build trust with others is to become more trustworthy oneself.